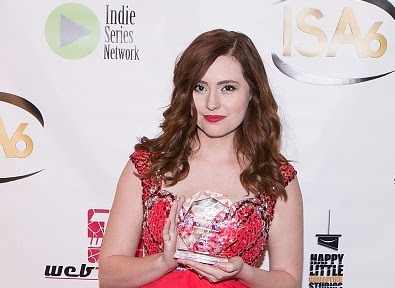 On Wednesday, February 3, the nominations for the 7th Annual Indie Series Awards (#ISA7) will be revealed on a special episode of Serial Scoop Now, airing at 3 p.m. ET/12 p.m. PT. Former Days of our Lives actress Jillian Clare will host the reveal from the El Portal Theatre in Los Angeles, once again home to the ISAs ceremony on April 6. Nominees will be revealed in 30 categories, including the newly added Best Original Song and Best Sound Design. Clare has been nominated for five ISAs over the past five years, winning in 2014 for her work on the drama Clutch. She played young Abigail Deveraux on Days in 2003-2004. Days of our Lives star Eric Martsolf (Brady Black) returns as host for the 7th Annual ISAs, joined this year by Jen Lilley (Theresa Donovan on Days).